If you read this blog regularly (or semi-regularly), then you may have noticed that I haven't posted much in the last few weeks. (Then again, it's the holidays and there are far more important things in life than reading my blog). The truth of it is that I have had no words. An inability to articulate. It's a rather frustrating place emotionally and spiritually for someone with the heart of a writer. For someone who cannot shake this feeling that when I write, I'm doing something that I was made to do. I play at being a word smith and being raw and honest and transparent for the sake of hopefully sparking encouragement in others to keep running this race, with our eyes on the Author and Perfecter of our faith. One day, a few weeks ago, I stood in front of my husband and finally found a way to describe the state I've been in lately. Okay. For the last few months. Alright. Basically, the last year or more. 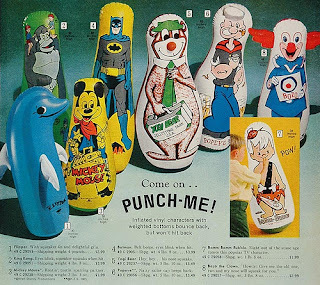 Did you ever have one of those blow up toys that you punched and it would fall over and then pop right back up? When our daughter was a toddler, she stood on one side of this kind of toy with her cousin on the other side. We became the audience to this hysterical game of our girl punching this toy toward her slightly older cousin. It would hit him, he would stumble, and then the toy would bounce back up and he would hit it back at Caris. She, too, would stumble back and then reciprocate. I don't know why we thought it was so funny how these two were going toe to toe to prove who was boss. But as 2015 comes to a close, I feel as though I am on the receiving end of those hits. Like I am the toy, working hard to just stay upright. Then something happens and I take a hit and fall over. And just about the time that I pop back up, another hit comes. Truly, these hits are not anything of significance, really. It's not that this year has been marred by some major struggle or tragedy or trial. That, in fact, is part of my frustration. Why should I feel so battered when I really cannot identify any one thing that is horrible or awful? Certainly, nothing life threatening happening over here. I'm wimpy that way, I guess. You see, my word for 2015 has been freedom. And I can see in hindsight that I had visions of being like Mel Gibson in Braveheart. Blue painted face, fierce and determined, screaming FREEDOM at the top of my lungs and then reveling in the joys of victory! Except for one little thing. As I now recall, that movie scene involved a lot of battles. Fighting. Struggle. Effort. I honestly cannot even remember the outcome of that fight scene? And while I entered this year with a gleeful anticipation of the spoils of freedom, I was completely ignoring the road that it usually involves to get there. I fancied myself along the "unforced rhythms of grace" and joyfully skipping through the fields of freedom, with bright sunshine beaming down upon me and a lightness in my heart with a spring in my step. No longer being weighed down and dictated by a pursuit to earn man's approval. No longer carrying the weight of worry and anxiety. Freed from the idols that distract me. Having thrown off the sin that entangles me and released of all that hinders me. Um, yes. Except for a few minor details that I naively ignored going into this year. First of all, this is not my home. And to me, a faith walk is far more a wrestling match than it is a walk or a run. I will always battle my flesh and my nature that seeks my own comfort and my own agenda, while I am convicted and struggling to seek His glory and His pleasure. That is the heart of the process of sanctification. Second of all, to be freed from something, you have to battle against it. And that is where the repeated hits of this year come in. Financial hits. Which I wrote about here and here and here. Yes, I came clean with each of you about how we are Dave Ramsey flunkies. Who knew that this song would continue to play on loop for the remainder of the year? Sinks falling off walls. Broken A/C units. (Yes, plural-- both units, just days apart). Dead dryers. Busted water heaters. The sequel involved a freaky ear injury to my son, broken down mini-vans, bald tires, another car that wouldn't start, cavities, and so on and so forth. First world problems, basically. Just in rapid fire succession. So, I reacted in my typical weak faith way. Like Eeyore. All woe is me and throwing a big old pity party. Didn't you get your invitation? Other hits this year involved hard relationships, questions of my purpose and place in my church and the world in general, longings unfulfilled, seasons of waiting, and those nagging mothering concerns that tackle me like a quarterback sack. BOOM. Hit square in the face. Fall to the side. Then bounce back up. Upright again. Only to face another direct hit. Through the course of this year and our church's Bible reading plan, God has been dealing with me. Firmly. Gently. Tenderly. Unmistakably. To point out all the things that I allow to rob me of my freedom. Late one restless night (it was November 7), I grabbed my phone and typed this note to try to release the burden of the thoughts that denied me sleep. What freedoms have I denied myself because I have overcomplicated my faith? I've tried to live by restrictive rules? And exhausting religion? Chasing after an elusive calling and purpose and perceived road that God never intended for me? For any of us? Here are the blows that eventually brought me to my knees. I've wanted resolutions to my waiting more than I've wanted God. I've sought assurance and peace by placing confidence in financial margins. I've made demands of God and plainly and boldly told him how things should turn out. I've pursued and plotted how to use my gifts and my talents, with the hidden agenda of being noticed and gaining an audience and being applauded. I've cared more about certain outcomes for my children than I've cared about their own wrestling matches to know God more. I've wanted the result more than the precious sanctification process. Not just for them. But also for me. (Yes, I like to be in control! And performance driven? Just a smidge). And here's the doozy. Here's the kicker. I've spent my lifetime serving a God whose character and whose grace I've actually never really known or sought to grasp. Reading through Isaiah and Psalm and Mark about three weeks ago, a huge hit between the eyes had the outcome I believe God has desired all along. All the lifelong year this year, as I've fancied myself hungry for freedom. "Lord, deliver me from any other desires besides you. Help me long for you more than my agenda. Help me place all my confidence and assurance in your provision-- feast or famine. Help me to quit telling you how I'd like things to turn out and start asking you how you'd like them to turn out and what your plans and purposes might be. Help me see and grasp your glory that I might hunger for nothing else, nothing less. Help me release my children and my family and my life and everything else to you. Remembering that you have authority and power over all. Help me to teach them that you care about what troubles them and you care more about their holiness and their hearts than you do about anything else. And help me to know you. Help me grasp you. Help me understand you. Help me rest in that glory of yours that makes everything else pale in comparison." So bruised and tender and tired, I laid down on the mat and quit fighting. To let God be the winner of the wrestling match. Or at least this latest round. And I must say, that act of contrition and repentance and confession had me walking out of my War Room with a sense of satisfying freedom. How like God's kindness that within a couple of hours, we received a very unexpected financial provision that released us from debt, yet again? He didn't have to do that. But he showed his faithfulness one more time even when I was faithless. To say that he hears. He sees. He has me. He is the power over all of my concerns. And I want that act of grace and loving kindness to be an encouragement to any of you who can relate to my struggles. I want you to see him in my story. I want you to know that when you hand it over to him, he has it well in hand. So, as 2015 comes to a close, I've learned that the lightness of freedom does not come until the battles rage that reveal all the burdens and chains and strongholds and misconceptions and misunderstandings and deceits are fully revealed. Identified. Laid bare. And then laid to rest. Set aside. It's a process I'm sure I'll repeat again on this side of heaven. Yet somehow, I see that God did intend freedom for me in 2015. But not only the great feeling once it's realized, but more so-- the long battle to wrestle against that which hampers freedom. The long process to identify and realize and learn about the enemies of freedom. That the ongoing war against them might be more easily and readily fought in the future. No matter how many hits that involves. That instead of wailing about the hits and the falling over, I might instead be thankful that God is the weight that grounds and steadies me. He is the one who holds my feet firmly on the foundation of the precious cornerstone. That I might learn to pop back up faster and to no longer fear the hits that will undoubtedly come. Because He is for me. He has a purpose and a plan for every area of my life. For every member of my family. A purpose and a plan motivated by his great love for me. Freedom comes through the brutiful process of surrender and humbling myself before his mighty throne. Assured of his tender and faithful care and grace that is broad and deep and wide enough to catch me every time I fall.